Here is a lady with a history of outstanding compositions for other artists…Luther Allison, Johnny Rawls, Albert King are among the stars to have covered her songs. She also has a number of albums in her own right, going back to her debut in 1993, Southern Woman. Who is this talented lady of the blues and country? Step forward singer, songwriter and keyboard player, Sandy Carroll. Although a lot of her output has been more country, on this release as she says, “Returning to the blues is my comfort zone… Blues music is universal and lets us know we are never alone in times of trouble or wonderment”. Now that is a statement I think we can all relate to; so how does she serve up this latest work? Well, first of all, a glance at the list of guest artists give the first clue. Add in the fact that Jim Gaines is behind the console and we are set fair for a warm and thoughtful ride. It all starts with Soak Me in the Spirit, a mid-tempo blues with a solid gospel theme to the lyrics (the spirit is not of an alcoholic persuasion) and some very tasty guitar. Sandy’s piano playing is like her voice…subtle, sensuous but with a hint of hidden depths. Blues All For Myself is a sultry blues with perfectly judged guitar illuminating the melody and backing. Breathy vocals add to the atmosphere and it all comes together rather well with keyboard backing and a lovely guitar solo. Somebody Gotta Dance changes to a rockier country styled song, although the guitar has a more Nick Lowe feel to the sound and playing. There is a gospel feel to the refrain to keep it different. 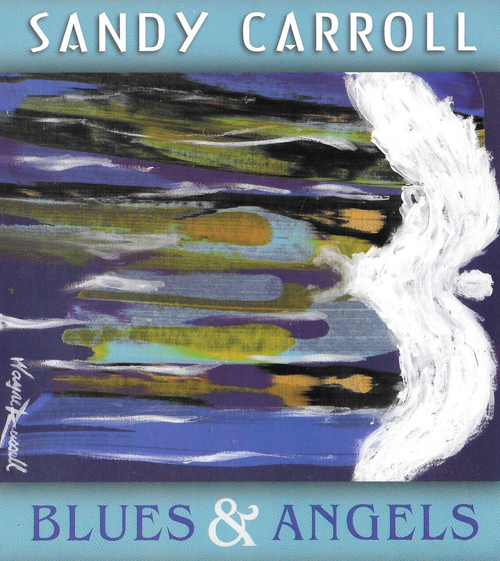 Wrapped in an Angel takes a different step again with its slow blues tempo and the vocals in Sandy’s lower register which adds to the spiritual message in the lyrics; stick in some wonderfully understated guitar fills and this is a lot better than it sounds…honest! MamaDon’t Like It takes us back to a mid-tempo country rocker. The bass is the best bit on this one as it plays a simple but really effective and lilting pattern. It also has an entertaining guitar solo to lift it above cliché. Love Is A Wonderful Thing is up next and I cannot disagree with the subject, and actually revel in it as the keys and guitar deliver a superb slow blues rhythm for Sandy to sing along to. You’ll be singing along too as the chorus gets to you. Slings And Arrows slows down even more with a dramatic intro and melody generating a Native American tang. Sparsely picked guitar backs the vocal before moving tothe fore with some subtle and lovely sounding and clever traversing of the fretboard. It is the track I keep ging backto as the guitar pieces keep on getting better every time. Headin’ Home picksup the pace and, courtesy of some glorious wah-wah and suitably sleazy organhits the funk button and, despite the spiritual message, it works well. RoadAngel is next and captures the attention as it employs superb slide guitar,greasy organ (!) and electric piano to conjure up Bonnie Raitt with added rock.Penultimate track, Movin’ On, could well be the theme song for the next seriesof New Tricks with its lilt and happy backing, although if it ever used, I doprefer Sandy to Mr Waterman.The album’s intimate closing track, Mississippi Me,is performed with only piano and vocals and really showcases Sandy’s abilitiesas a songwriter, singer and player…a lovely way to wrap up this album. It is a difficult work to summarise…not bluesy or rocky enough for some, I’d wager, and not country enough for fans of some of her previous output… I, however, enjoyed every minute of every track and everytrack is brilliantly written and performed. It will be a regular feature on myplaylists; especially Mississippi Me when I want to wind down and be soothed bythe lyrics and vocals. Equally Road Angel is already a regular returnee on theiPod for the sheer fun. Give it more than one listen and appreciate the detailand care that has been crafted into every note…you won’t be disappointed.